Lawfare also reported there are “long-term, programmatic consequences long after we’re finished” with Trump — of allowing a FOIA request to apply to a highly-confidential FISA warrant. AP reported Trump’s Supreme Court nominee Brett Kavanaugh suggested at a roundtable discussion in 1999 that the 8-0 ruling in 1974 that forced Nixon to turn over the Watergate tapes may have been wrongly decided. Guardian reported Trump’s “zero-tolerance” policy has turned the windowless basement beneath the federal courthouse in San Diego into a pop-up “dungeon” like meeting place for lawyers and migrant clients. On Thursday, BuzzFeed reported 123 asylum-seekers being held at a federal prison in Sheridan, Oregon, many of whom are Sikh and Hindu, are being denied religious items and time and space for prayers. Nikolaev’s son Andrey, who is studying in the U.S., volunteered for Trump’s 2016 campaign. Nikolaev was spotted at the Trump Hotel DC during Trump’s inauguration in January 2017. On Sunday, Reuters reported that in April 2015, Butina traveled to the U.S. with Alexander Torshin, then the Russian Central Bank deputy governor, for separate meetings with Stanley Fischer and Nathan Sheets. Putin acknowledged that he wanted Trump to win at the Helsinki summit joint news conference. The Atlantic noted the White House transcript initially did not include this question in their transcript. On Tuesday, at a Veterans of Foreign Wars convention in Kansas City, Trump told farmers caught in his escalating trade war to be “a little patient” and they would be “the biggest beneficiaries” of his policies. On Thursday, Facebook’s market value fell by $119 billion or 19%, the largest one-day loss in market value by any company in U.S. stock market history, after releasing a disastrous quarterly report. American voters believe 51-35 percent “that the Russian government has compromising information” on Trump, and 68% are “very concerned” or “somewhat concerned” about Trump’s relationship with Russia. Cohen alleges he was present, along with several others, when Donald Jr. informed Trump about the Russians’ offer. Cohen claims Trump approved going ahead with the meeting with the Russians. TMZ first reported Kristin Davis, known as the “Manhattan Madam,” was subpoenaed by Mueller’s team as part of the Russia probe. Davis worked for Roger Stone for over a decade and the two are close friends. 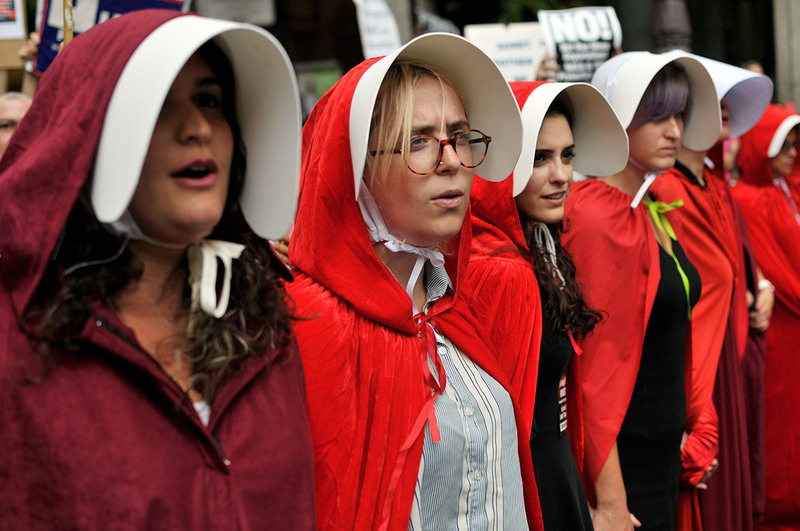 Protestors in Handmaid’s Tale attire gather outside a fundraiser attended by Vice President Mike Pence and Lou Baretta, at the Union League, in Philadelphia, PA, on July 23, 2018.